The Session #52: What Does the Stuff Lurking in our Closets Say About Us? For this Session, Brian Stechschulte of All Over Beer has asked us to write about our beer collectables. I danced around the question. I find this months Session on beer collections putting me in a surprisingly self-reflective mood. Perhaps considering how little we can carry with us travelling through this world, our collections of non-essential items represent the things we cherish and value, the things we don’t want to leave behind. Some proudly display their collections in a prominent place for the world to see, but most often these collections spend most of the time in a dark closet, possibly for reasons of storage convenience, but more likely to hide a certain obsession or fetish from others we only want to reveal to a trusted select few. So what do I have collecting in my closet? Running T-shirts heaped in a big pile. Most are from races I’ve run over the past 5-10 years. There’s the few odd ones, like my bright red Jolt Cola T-shirt I’ve kept from my college days back in the 80’s. Whenever it was time for a big workout or long run at a key point in my training, I’d put on my Jolt Cola t-shirt to give the workout a needed “Jolt”. I scammed this shirt from the Jolt Cola company by sending them a letter, saying my first name was “Joe”, telling them my friends called me Jolting Joe because I drank so much Jolt Cola and suggesting it would be in Jolt Cola’s best interest if they would send me a T-shirt and get a little free publicity. A week later, a package came back in the mail with the Jolt Cola t-shirt with a letter from a nice marketing lady telling me she loved my story. If it were only true. My name isn’t Joe, and my only claim to fame with Jolt Cola was creating a mixed drink called a “Gin and Jolt” which consisted of one can of Jolt Cola with a nearly equal quantity of Gin. I became a bit of a legend in my dorm, or at least I thought I was, by guzzling this stuff on Saturday nights with a bunch of other guys on my floor who didn’t have much going on that night either. Gin and Jolt was every bit as mind-bending and nauseating as it sounds, a precursor to the currently notorious Four Loko, except it tasted a lot better. The Jolt Cola T-shirt is a product of a brief, happy time where I both ran and drank pretty hard. Another notable shirt in my collection is my 1992 USA Olympic Trails Marathon T-shirt. The Olympic Trials Marathon involves over a hundred really fast American marathoners who’ve run a certain marathon time to compete for the honor of representing the United States in the Olympics. In 1992, this race was held in Columbus, Ohio where I was going to graduate school and on that day I rode after the runners on my bike as they raced all over the city. I was so pumped up from the experience I decided right then and there to make a four year commitment to qualify for the 1996 Olympic Trials Marathon, never minding that I hadn’t even run a marathon yet. Understanding I had zero chance of making it all the way to the Olympics, I just wanted to be in the big race and technically have a shot at being an Olympian. Two years later with three marathons run in times nowhere close to the Olympic Trials qualifying standard, reality started setting in about my Olympic Dreams, and I reluctantly gave them up. I did plenty of runs in that t-shirt, and those big Olympic dreams carrying me to more modest running accomplishments. This stretched out, faded and worn t-shirt is as shot as my Olympic chances were, but it still reminds me of certain audacity and innocence of that time. 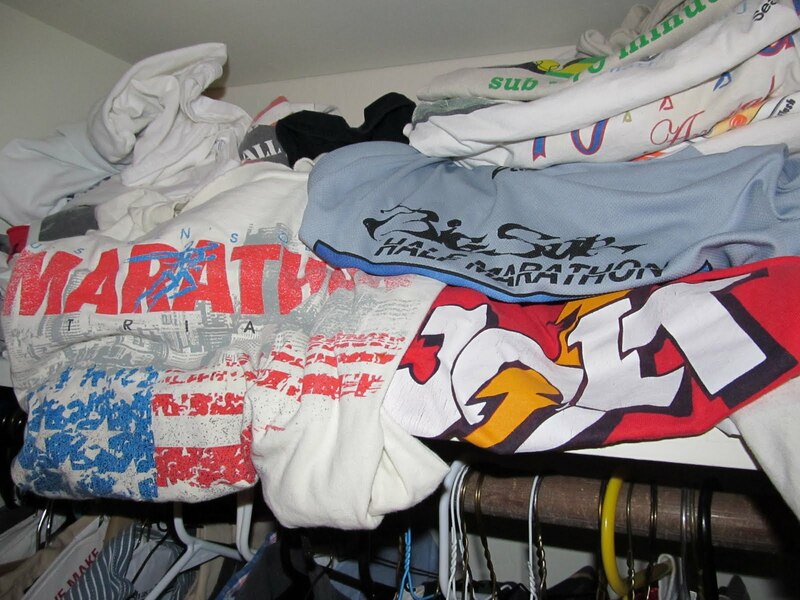 The rest of the T-shirts in that big pile are from various races, big and small that I’ve ran over the years. Each one represents a running milestone, a small story. Some represent a major running effort and focus for a big race, others just a early season fitness test, and still others just some fun Sunday morning spent running around some neighborhood as part of a local fund raiser, one of those small races that have a neighborhood intimacy that large races like the Boston Marathon or Bay to Breakers cannot capture. But this Session is about beer collectibles, not running collectibles, and as you might have guessed from my lengthy avoidance of the actual Session topic is that I have no beer collectibles to speak of. Just a couple glasses from beer festivals, 3-4 beer T-shirts that were gifts, and I had a stack of beer coasters from different bars and brewpubs stashed in a kitchen drawer but I think I must have recycled them, since I can’t find them anymore. I suppose I could trot out of few of these random beer trinkets as my “beer memorabilia collection”, but that just didn’t seem all that interesting. Maybe it’s because these race t-shirts represents a small running story, often associated with a lot of hard work and effort while a beer trinket represents, well, drinking a beer, which in most cases, doesn’t require much work. OK, I admit my choice of collectibles seems a bit odd. Most of us want to remember all the good times, even if those times involved nothing more than drinking a beer, and most recall their running experiences about as fondly as a trip to the dentist. Looking back at what I’ve collected, the good times were those when I experienced extreme fatigue, felt like puking, and ended up smelling really nasty. But come to think of it, a couple of beer festivals also turned out to be like that. Now I don’t want to veer too deeply off into self-psychoanalysis, especially since I paid a pretty good therapist a lot of money for that a few years ago during a particular tough time in my life, and I’d rather not go back there. But I recognize my peculiar personality and when I look at the things I’ve collected over time, it’s more than a little bit like looking in the mirror. So I ask for this Session, take a good look at your collections, beer related or otherwise. Is that you? You know they would've sent you that T-shirt for the free marketing anyway, like even if your name was Derrick. As for it being a good story…that's all marketing is! Maybe you can ask Rhonda for a Moonshot Beer shirt (the one with caffeine) now that she's closed up shop and will probably dump them all at Goodwill.